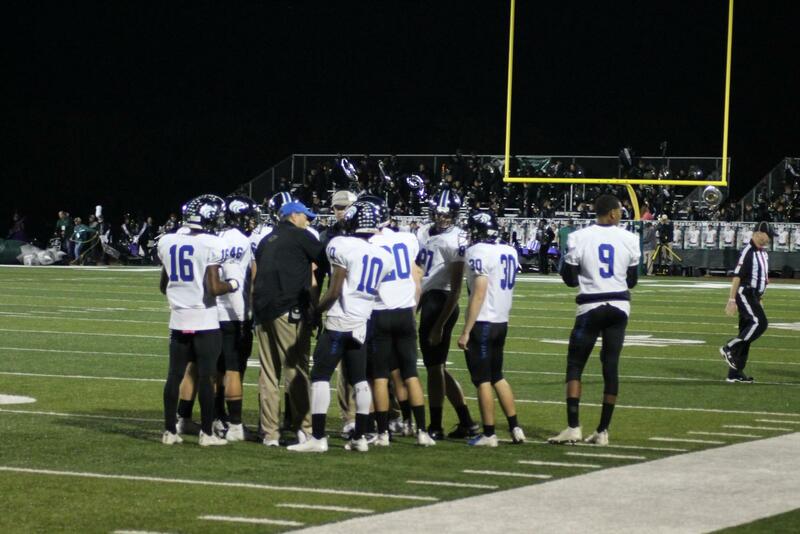 Plano West Head Coach Scott Smith talks with the offense in a huddle in last week's game against Prosper. After a rough 55-7 loss in Prosper last week, Plano West is turning their attention to tonight’s game against Plano East, the third-ranked team in District 9-6A. The game will also pose as a special one for West, as it is their homecoming game. 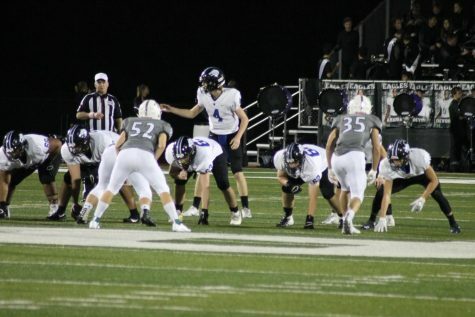 Plano West QB Will Cannon (#4) directs the offense against Prosper’s defense. Cannon, who filled in for injured QB Danny Davis, threw for 99 yards and rushed for 26 against Prosper. Plano East won last week against McKinney 45-42 in double overtime, with Panthers’ kicker Angel Martinez drilling a 39-yard field goal to down the Lions. The Panthers did lose both games in the two weeks prior to the win against McKinney, with a 36-74 loss against Allen and a 19-41 upset at the hands of Plano Senior. Plano West and Plano East will kick off at 7 p.m. at Clark Stadium. Plano East is averaging a staunch 34.4 points and 393.4 yards per game. Plano West is only totaling an average of 12.6 points and 256.1 yards per game, while allowing approximately 41.1 points per contest. Coach Smith could not confirm whether or not QB Danny Davis or WR Tavarius Garland would be healthy for tonight’s game. Both missed last week’s game with injuries. Smith did say that Davis was day-to-day. Garland is fourth on the team in receiving yards with 172. Davis is 32 yards away from 1,000 passing yards on the season. Starting running back Noah Scroggins is 30 rushing yards away from breaking 500 on the year. Plano East WR Jaelen Anderson is 45 receiving yards away from 800 on the season. Along with Anderson, receivers Braylon Henderson and Josh Allison are 24 and 47 yards away from reaching 600, respectively. Junior RB Trey Scott-Jones is the only running back on Plano East’s offense with more than 100 rushing yards and three touchdowns (he has 706 rushing yards and eight touchdowns). Scott-Jones was held to 80 rushing yards last week against McKinney and only 33 the week prior against Plano.